I haven’t talked much on this blog about Pixie’s pregnancy and birth. I don’t really know why. Probably because while I experienced pregnancy and birth I felt like it was all very private, too private for such a public space. While I had a warm little soul slowly growing inside me, it was so intimate, I couldn’t bring it here, not too often, not too much. The Pixie is almost six months old, can you believe it? So now I think it’s time. 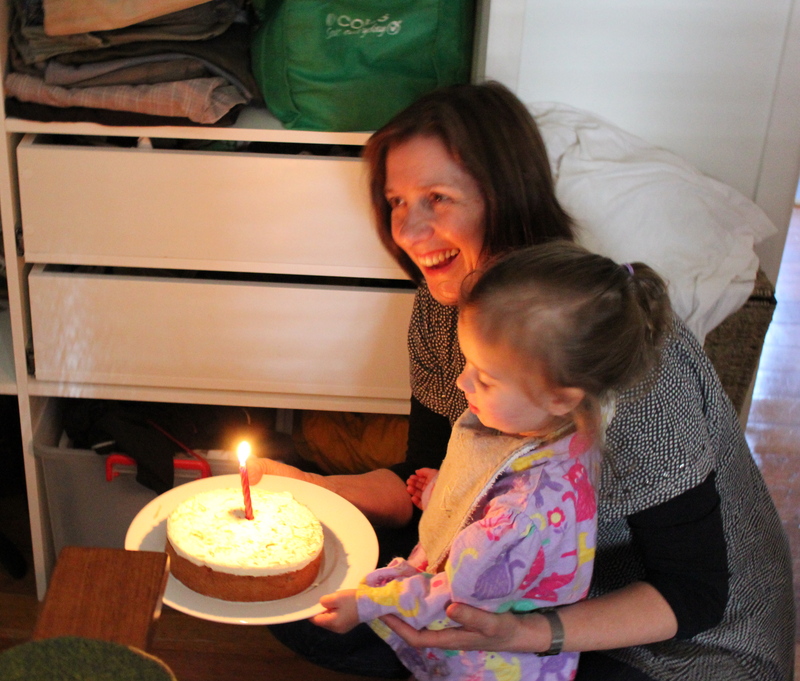 It’s time to tell you, if you hadn’t already guessed, that we had a homebirth this time. There is so much to say and to share about this. Today I will give you a glimpse, a snippet, or I fear this post will be pages long. Some part of me still feels disbelief that we actually did it. Did I really do that? In the quiet dark of my lounge room with a select circle of hushed supporters, gentle hands placed on my shoulders, my back? Or was it just a dream? It was a hard choice. It didn’t come easily. There was so much pulling this way and that. So many opinions. I was drowning in them, mainly – but certainly not all – of the rude and negative variety. With quiet minds and much research behind us, we followed our hearts and did what we knew was best – for us. We didn’t tell many people. We kept to ourselves and our support team (who, because I’m sure you are interested, was made up of my naturopath during early labour, then, two midwives – one of whom is my sister – a doctor, my husband and my mum.) We did not have a placard to hold or a message for other women and men. Not then, not yet. We believed in our decision and did not feel we should have to justify it to people who were mainly uneducated about our choice, particularly while I was pregnant. I did not want people’s comments, fears and ill-informed ideas sticking to me, attaching themselves to my thoughts, my days and my baby. This was harder said than done. I stayed within myself and the decision we had made as a couple as much as possible. But then we hit an obstacle. It shouldn’t be as big an obstacle as it was at the time. But there it was nonetheless: Pixie was breech from 29 weeks. (Of COURSE she was!) I have written a much more detailed version of my breech experience and Pixie’s birth here, if you care to read it. Personally we decided we would prefer to go to hospital if she was breech, however unfortunately it seemed our options here were horribly thin in this regard, disgustingly so… After much to-ing and fro-ing, we had an external version in hospital at 36 weeks, and from then on, a blessing: little Pixie stayed head down until the day of her birth, and our meeting, in the sacred space of my own home with people who had shared my entire pregnancy with me (both pregnancies actually, aside from my doctor), who knew my ins and outs, who understood me, who cared about me and my baby. Having experienced both a hospital and a homebirth, I can see both have their merits. But what I see clearest of all is the right of all women to choose their most appropriate path, the path that after much education and discussion, suits their baby and them best – not a doctor or a midwife or a homebirth advocate or their mother or their next-door neighbour’s husband’s cousin. And not be judged for their decision. Where did you have your baby? Did you love or hate being pregnant and giving birth? Or somewhere in-between? Did you feel supported? Knowledgeable? In control? Safe? I’d love to hear your stories too. *I feel funny calling this a “public space” as although it is extremely public, I continually have to remind myself that people actually read this. It is all about choices! I think we made the right choice for us. It was amazing. I chose to have a homebirth and it was the absolute best choice for us. I was open with people about my choice, but I was ready to direct them to Ina Mae Gaskin’s books if I was given a hard time. Although, sometimes I just told them flat-out that it was the safest and best way for my baby to be born–I knew it in my heart. Good on you Melissa for trusting your instincts and doing what you knew was best for you and your baby. Ahh childbirth. So amazing. Most amazing experience of my life. I think each mama knows where she’ll feel most comfortable and relaxed be that home or hospital. For me, home. it was just want I needed. I just loved crawling back into my bed with my tiny bebe at the end of childbirth.